The most important fact of confession, is that one goes. I think it is more humbling face to face than behind the screen. The result is the same, hopefully. Wonder how many more years before there are enough Priests to hear our confessions. You might ask how many people thank the priest for this privilege at the conclusion. You have a great blog and one could spend days reading Catholicity. Thank you. Thanks for writing about this. I'm a new Catholic. I was Pentecostal for many years. I completely understand about the public confession - had to do that as a young adult when I was caught in a very public sin. It was more about humiliation, I think, than about confession and restoration. For years after that public confession, I was treated a pariah. In fact, it's not thirty years later - and people from that community still bring up my sin. Apparently, God forgives - but they never forgot. So I came to Reconciliation pretty freaked out about the whole idea. It almost derailed me from coming into the Church. The image I had of God was an angry, vindictive one - who barely tolerated me. So when I made my first Confession, I was pacing around trying to decide if I would go or not. Finally, at the last possible minute, I bit the bullet and actually said out loud, "Father, nothing so far about the Church has proven to be unorthodoxed - I'm scared. But I will." In my heart, I decided I would trust God on this one. My parish is the Co-Cathedral of our Archdiocese. We have kneelers and the option for behind the screen - but as all new Candidates, we were not allowed the option of behind the screen. All I've ever known is face to face. So I had my little "cheat sheet" and explained to the priest that I was new. I thought I was going to have a panic attack. Hearing that I was new, he welcomed me. I'll never forget the weight of the solemness of his words when he said, "What sins do you need to confess?" Instantly, it felt like the entire room faded away - and as if this huge light were shining on me - and that I couldn't hide - but oddly, I did not want to hide. It was if he retreated, too. I experienced Jesus present to me in a way I cannot describe. When I spoke, I was aware I was in the presence of Holy God. I couldn't hide if I wanted to. When I began to speak, I surprised myself - I didn't really realize what was important - but the Spirit knew - and those were the things - only a few that came forward. When I finished, the priest laids his hands on my head -and prayed for me - and when he touched me, a warmth flowed over me from the top of my head the soles of my feet. I will never forget it. I knew, for the first time in my life, that my sins were truly forgiven. For days afterward, I felt a "cleanliness" before God that I'd never experienced before. Though exposed, I knew I was forgiven. For me, face to face confession is about being accountable. It's about owning up to what I've done and saying it out loud - so that the gravity of what I've done is real to me - God already knows the consequence of my sin - it's me that isn't always aware of it. I guess in some ways, being mortified about confessing is a good thing - I can feel the sting of being known. But more than anything, I felt God's love through the priest - Jesus was present to me in the Sacrament. I'll never forget that. I guess, at some point, I will have an opportunity to avail myself of confession behind the screen. I appreciate your thoughts. I'm grateful to read about another's thoughts and about the tradition of the church and Her history. I am a little troubled by your statement that you all were not permitted the option of going behind the screen...it is my understanding that behind the screen is still the norm (face to face being an exception), and that all parishes must offer the possibility of going behind the screen. I hope you choose to go behind the screen someday - if you have trusted the Church this far, then think that behind the screen has been the norm for over a thousand years, and the Church would not have had it so if there were not very good reasons for it. Behind the screen is not an option for Catechumen and Candidates in our Archdiocese. We were taught that it is the expectation - and we were not allowed the option. In fairness, for my first confession - it was at a larger service with multiple priests behind screens - and there wasn't anywhere to kneel. We do have kneelers in our Reconciliation Rooms - but I've never used them because we were taught that Confession was face to face. So we saw older Catholics using the kneelers - but not us. Reconciliation is such a gift. Since I came into the Church and after that first experience, I go regularly and it is always something that brings me closer to God and helps me to understand how to get back on the Way...when I've gotten off the path. Reconciliation actually brings me closer to God. I don't want to run away and hide. I tend to be more honest and direct with others. I do not pretend to be something I'm not. I tend to tell the truth better. I don't know about you - and I'm not exactly sure how others experience it - but my whole orientation changes. I experience others with more tenderness - I am not as likely to judge. I can always tell when it's time - it begins to come to mind over and over, when I wake up in the morning, as I go about my day, before I go to bed at night. I feel compelled to go - and sometimes my schedule doesn't permit and I cannot always go to my home parish - so I will go to another parish. One thing I know for sure...Pentecostals got nothin' on Catholics. They may rail about sin all the time - but Catholicism requires that I be more honest and forthcoming than I ever was a Pentecostal. I don't get to make excuses or blame someone else. I have to own my own sin. It also holds out the love and acceptance that I need so that I can come closer to God and to live my life in obedience to Him. It allows me the most precious words, "Your sins are forgiven, go in peace." No sweeter words have I ever heard. If I ever find myself in a face-to-face confession (non-italian version), I'll just look the priest dead in the eye and make a general confession so I can get my worst sins in there. Then he'll be the one running for the screened confessional. I know this is years after this post but I feel I have to comment on behind the screen confession: this also is a protection for the priest. Especially with sexual sins, and when women confess in general the priest must be protected from facing the penitent. I've never seen any mention of that. We must always be discrete! That is a great point. I am going to rework and update this article and incorporate that thought. You don't want an attractive woman confessing some lustful or sexual sin and the priest looking at her while she's talking about sexual stuff...he might think it's kind of hot and it could become a snare. were not going to confession. The idea was to make an often embarrassing encounter easier to deal with at a human level. 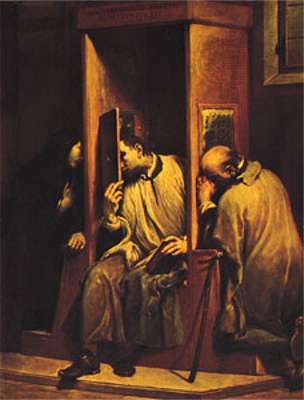 Therefore the notion of face to face confession is retrograde in the sense of serving the bulk of the catholic faithful. That is why so few now go to confession and another proof of the disastrous effects of vatican 2.